What is Dedicated Internet Access and Do I Need It? What is the difference between dedicated internet access (DIA) and “best effort” Internet service? DIA is more about the business terms of the Internet connection and not the technology or delivery method (fiber optic, DSL, Cable, wireless, etc.). Dedicated Internet Access means that the specified amount of bandwidth sold has been carved out and dedicated for your use. In the case of national cable and phone companies DSL and Cable Internet is merely a “best effort” service. 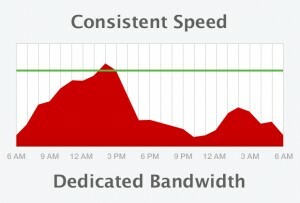 The “best effort” services oversubscribe the bandwidth sold compared to the bandwidth available. Because not every customer is using their connection to the maximum during every minute of the day, this can be a satisfactory solution. Oversubscription can be the only way a small business or residential customer can receive Internet at an affordable price. At times the ratios can be off and capacity/congestion issues can occur. With “best effort” services this can mean that your (“up to”) 25Mbps service is only operating at 5Mbps in reality. In some cases this is merely a temporary nuisance. Nobody like slow downs but for residential Internet service this is probably acceptable. Even for some small businesses it might be ok. But in many businesses slow-downs and sporadic service is completely unacceptable and costs the business money through lost productivity. DIA service performs consistently day in and day out, and has guaranteed minimums and uptime. DIA service is sold as a rated speed, not an up to speed. Dedicated internet access is like having your own personal lane on the Information Superhighway as opposed to sharing the same traffic lanes as everyone else. Everyone knows that at certain times of the day traffic becomes congested. Even express lanes, like “business class” offers, aren’t always a sure thing. But, when you have a personal, dedicated lane you will be traveling at exactly the speed you were guaranteed. In today’s marketplace fiber optics are often the delivery method of choice for the national carriers to deploy Dedicated Internet Access. E-vergent can provide DIA at 99.999% reliability via our high capacity microwave network. Our build-out costs are normally a fraction of the cost of fiber. Via our service level agreement, SLA, we can provide enterprise class levels of consistency, uptime, and guaranteed repair resolution. In many cases E-vergent can provide a “Cadillac” Internet experience to companies that previously thought this level of reliability (via fiber) was out of their grasp. If your business’ success is absolutely reliant upon the Internet, Cable and DSL Internet service translates into your company losing money. Switch to a Dedicated Internet Access provider like E-vergent today to stop losing money on your business Internet service.